Growth in the e-commerce market has given customers a variety of avenues to acquire their favorite products. For businesses, however, it’s hard to analyze exactly where their sales come from and whether or not an online and brick-and-mortar presence can be mutually beneficial to future growth. Consumers are moving toward a blend of offline shopping supplemented by a period of online research. 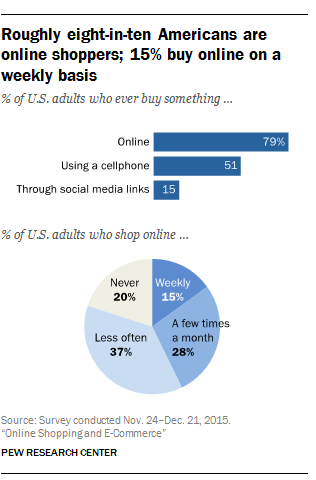 While online sales have been on the rise, only 15 percent of Americans make purchases online on a weekly basis, according to a study from the PEW Research Center. About 45 percent of Americans have used a cellphone within a physical store in order to look at reviews or other product information. Consumers have long relied on the ability to get recommendations and reviews, hence the rise of websites like Yelp! and FourSquare. On the other hand, some consumers are more skeptical than others when it comes to the validity of online reviews. According to the same PEW Research Study,48 percent of U.S. consumers believe it’s often hard to tell if online reviews are truthful and unbiased.Consumers more often than not will use websites to compare prices and products and then visit stores to get a reassurance of product quality before committing to a purchase. Even if shoppers don’t directly purchase from a website, businesses benefit from empowering their customers with the tools to do their own research and be confident in their purchase. Such buying habits don’t necessarily adhere strictly along generational lines. A study conducted by RetailDive found 26 percent of U.S. adults frequently research products online prior to shopping for them in brick-and-mortar stores. The report then emphasizes the importance of a “compelling digital experience.” Certain things can improve the customer’s researching or shopping experience to create a seamless omni-channel shopping experience. Dirxion online catalogs give businesses a strong tool to allow their customers to do their own research. The search feature allows users to find the exact product they’re looking for without having to search through tabs and pages of results. Dirxion’s integration capabilities can bring a business’s existing e-commerce website into the catalog. Customers are able to interact with linked images that open to Quick Views or iFrames of the e-commerce site. Customers can then read pictures, look through photos and even add to their cart without having to leave the online catalog. Recently, MSC Industrial Supply announced strong Q2 results highlighted by increases in net sales (2.9% year-over-year), operating income (7.6%) and diluted earnings per share of $0.93, which exceeded expectations. A majority of this revenue, 57.8% of it, was accounted for by e-commerce operations. This is a growing trend for MSC, whose e-commerce has been a significant chunk of its revenue for a few years now (it was 55.4% in the year-earlier quarter). According to Digital Commerce 360, mscdirect.com, the company’s e-commerce site, is No. 97 in the B2B E-Commerce 300, a list that ranks companies on their annual Internet sales. The same article points out that CEO Erik Gershwind said that MSC will continue to invest in its e-commerce, by adding about 150,000 product SKUs in the current fiscal year and expanding above 1 million SKUs available online. Dirxion is proudly involved in buffering MSC’s e-commerce performance through the creation, linking and customization of the company’s online catalogs. The primary project that Dirxion and MSC build together is its Virtual Big Book, a full collection of MSC’s product SKUs organized and displayed through over 4,000 print catalog pages. 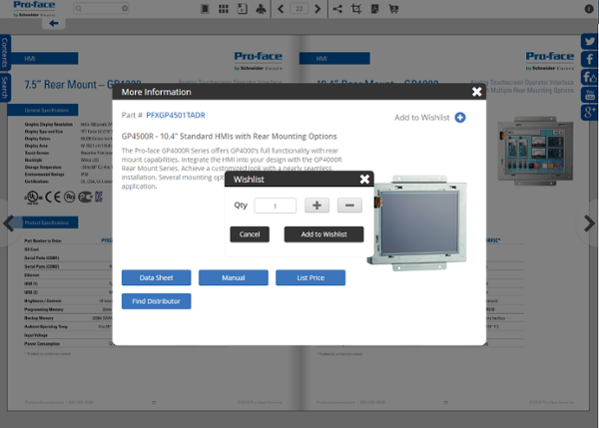 Each product number in the catalogs are linked directly to MSC’s e-commerce pages, with an iFrame of the product page displaying the corresponding information directly in the online catalogs interfaces. The image below shows the iFrame view opened on a desktop computer. Uniquely displayed on their website pages, the Virtual Big Book is embedded in a tab pull-out that can be found on the left-hand side. This custom presentation is enabled by custom coding created and shared among Dirxion and MSC’s website developers. The embed is made easier via HTML5 rather than Adobe Flash technology, which Dirxion successfully moved away from four years ago. MSC does a great job of maintaining fast-loading e-commerce pages, in spite of such a large database from which to pull information. The same standards of speed and loading efficiency are applied to its online catalogs. The Internet has created a new dynamic and structure for B2B businesses in which marketing teams, sales teams and e-commerce tools converge to maximize revenue. Some industry studies have painted a bleak future for sales teams, one in which they’ll be phased out entirely and replaced with automated e-commerce stores. The assumption is often backed up with data indicating a shifting consumer preference towards e-commerce. Even though Internet accessibility and overall technological adaption rates are increasing globally, e-commerce and traditional sales roles have integrated together. New studies and industry reports have now suggested B2B businesses can reinforce their existing channels while simultaneously integrating new technology such as e-commerce. In a Forrester Research study of B2B businesses, 89 percent of businesses surveyed indicated that implementing e-commerce increased their annual revenue. The modern business world is dominated by efficiency: who can attract the most customers, who can capture new markets the fastest and who can get the highest return on their investments. E-commerce websites have allowed sales teams to become more efficient, especially within the B2B market. Sales team members save time and become more productive when an e-commerce website is available for customers to fill out their own orders through a spreadsheet ordering format. E-commerce can be used as a tool for B2B sales teams. E-commerce websites can take large amounts of data and condense them into a portable fashion, essentially allowing your sales representatives to access your entire inventory from anywhere. Dirxion online catalogs serve as both a reference tool to sales representatives and a familiar, fully-integrated e-commerce experience for customers. For instance, Dirxion customer Proface America uses spreadsheet ordering functions in their online catalogs, which allows customers to independently place orders, freeing sales representatives from having to complete the process manually. Dirxion online catalogs can also be easily updated, thanks to in-house production and development teams, ensuring all sales representatives, no matter where they are, has access to fully-updated product lines and prices. In doing so, Dirxion customers mitigate production, printing and distribution costs previously associated with constructing print catalogs. Recent reports from the PEW Research Center have characterized a more digitally-connected elderly population. In the U.S., a record 46 million seniors (people ages 65+) account for 15 percent of the population, expected to increase by another 7 percent by 2020. Seniors have begun to close the gap between themselves and the rest of U.S. adults in the tech world. About 67 percent of seniors have or use the Internet, compared with 90 percent of all adults and the amount of seniors who report owning a smartphone having quadrupled in the past five years. 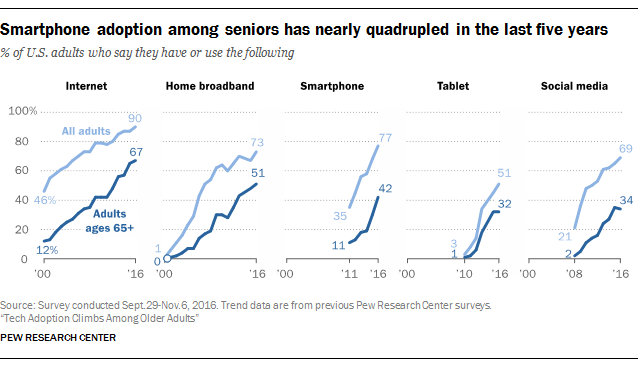 The adoption trends of seniors mirror those of the rest of the population with certain devices.Tablet ownership eclipsed e-readers, with 32 percent reported owning the former as compared with the 19 percent who own an e-reader. Within the broader population, tablet ownership has steadily increased since 2010, with 45 percent of the population reported owning a tablet (a 42 percent increase since 2010). The decline for e-readers was sharper than MP3 players, falling 13 percent since early 2014 to rest at 19 percent ownership among U.S. adults. Dirxion online catalogs turn PDF print catalog pages into an interactive e-commerce service in a familiar format. Using Dirxion’s integration capabilities, online catalogs can live directly on an e-commerce website, within social media platforms such as Facebook and wherever else consumers interact with their favorite companies and brands. The Dirxion online catalog experience is built with user experience and ease-of-use in mind. Since the move to HTML5 years ago, Dirxion has continuously made improvements in the interface and capabilities all while keeping consumer preferences and experiences in the forefront of the design and development process. Despite the increasing technological growth in e-commerce, email has more or less remained unchanged since the late 2000s. A recent article published by Mashable analyzed recent attempts at changes to the email experience, what it entails for email marketing and how consumer expectations for the platform have changed. The role of email evolved from a peer-to-peer messaging system to an “asynchronous message” platform to include newsletters, receipts, bank statements and more. In doing so, email became its own identity and information hub but cluttered users’ inboxes in the process. For its 3.7 billion worldwide user base, the Radicati Group estimatesroughly 269 billion emails are sent per day and the average office worker will receive 121 emails a day. Multiple technology companies have made attempts at tackling the cluttered inbox issue, with overall mixed results. 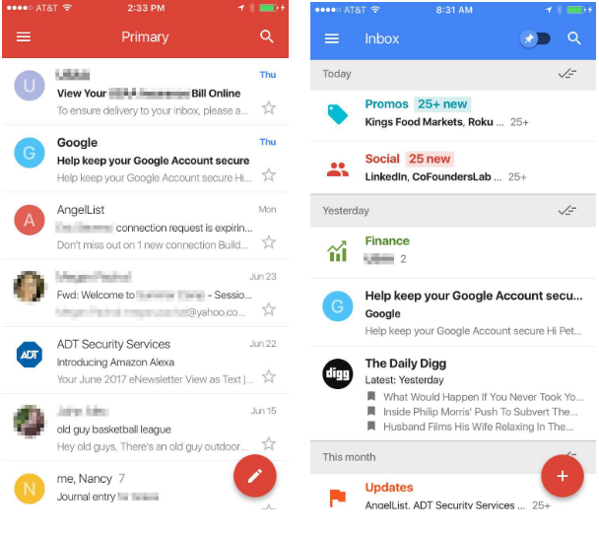 Google developed a mobile-first email app “Inbox,” Microsoft implemented Clutter to display only users’ most important emails while IBM attempted to combine to-do lists, calendars and documents into the app “Verse.” User feedback, however, was less than optimal, as Clutter was downgraded to the “Focused Inbox” feature in Outlook and Verse has an average two-star rating on its current version in the App Store. Like most aspects of the open-market competitive nature of the Internet, users have been shown to respond to content that’s personalized, strategic and intentional in design. According to Aberdeen, personalized email messages improve click-through and conversion rates by an average of 14 and 10 percent, respectively. Because of the now-cluttered state of most inboxes, businesses have to fight harder to get the attention of users and entice them to open and interact with their email marketing strategies. Targeted email marketing campaigns increase effectiveness and have become an industry standard, as large databases of data have made it easier to align campaigns with consumer interests and habits. Dirxion online catalogs can aid a business’s email marketing strategies as the familiar layouts and designs give a campaign an additional layer of depth and interactivity. Printing and shipping charges are eliminated with Dirxion’s services, which give businesses a new and engaging method to attract customers. The Washington Post reported today that Alfred Angelo, a bridal gown chain with stores across the U.S. and partnerships with over a thousand retailers, has suddenly closed operation. The store locations, which had closed without warning, has left brides across the U.S. wondering whether they’ll receive their dresses at all, or even a discount. The Wall Street journal published an article alongside the report after discovering the company filed for bankruptcy protection, which led to the closures of all their stores. David’s Bridal, a Dirxion customer and a close competitor of Alfred Angelo, tweeted earlier today announcing discounts for all brides and bridesmaids that were impacted by the sudden closing of the stores. Customers who rushed to store locations discovered many Alfred Angelo employees were puzzled and had only just heard the news hours before. According to reports from Syracuse.com, Alfred Angelo plans to file for liquidation under Chapter 7 bankruptcy. The discounts offered by David’s Bridal ranges from 30 percent off on Wedding dresses to waived “rush fees” for any alterations that need to be made in order to meet event dates. As a Dirxion customer, David’s Bridal has made strides to improve their customer experience and continuously looks to deliver on-brand, omni-channel experiences, most directly seen through their use of Dirxion online catalogs. The catalogs, optimized with HTML5, allow David’s Bridal to connect with their customers and lets consumers shop directly through the online catalog thanks to Dirxion’s e-commerce integration. Individual characteristic and demographic changes among consumers have been occurring across multiple markets throughout the past couple of years. The bigger picture forecasts a future in which e-commerce is expected to grow at continuous rates. Location has long played a role in a consumer’s decision to participate in e-commerce or shop online. When divided into two main categories, urban and rural, surveys conducted by Retail Dive found 4 percent of rural shoppers shop exclusively online compared to 7 percent of urban shoppers. When asked why they prefer to shop in stores, rural shoppers were found to value seeing, touching, feeling and trying out items at a margin of 9 percent greater than urban shoppers. In 2017, 55 percent of the total global population is expected to live in an urban setting, according to Ad Age. Urban population growth has been steadily increasing since 2007, when it first surpassed rural population. 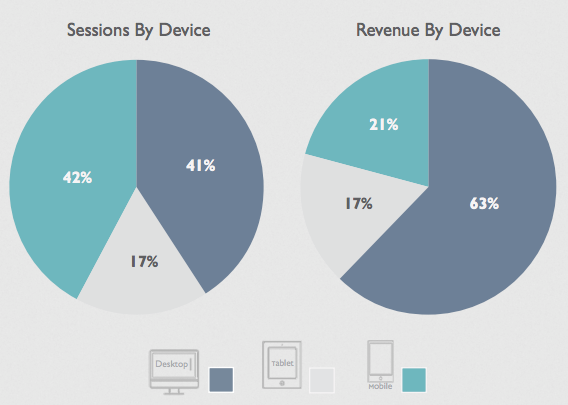 Mobile has continually been stealing market share from desktop or laptop computers. Despite this growth, the mobile experience still hasn’t been to par compared to traditional web browsing methods, and mobile hasn’t translated into as high of conversion rates. According to Smart Insights, mobile devices account for 42 percent of all sessions but only provides 21 percent of the market revenue for online shopping. Mobile e-commerce has been on the rise though,acquiring its own branding (m-commerce)and is expected to reach $284 billion in total revenue by 2020. At the current state of the market, consumers may not overwhelmingly prefer to use mobile devices to shop, but they’ve evolved to become powerful research tools for online shopping decisions. Dirxion offers tools for businesses to capitalize on the shifting trends and growth in the e-commerce market via online catalog services. Dirxion online catalogs are extremely versatile and optimized with HTML5 to ensure cross-platform and multi-browser performance standards are met. Dirxion online catalogs can be integrated into existing e-commerce platforms and live directly on a company’s website to ensure a seamless, optimized shopping experience for customers. Online shoppers have become accustomed to an interactive and convenient shopping experience. Design has since become a foundation of online catalogs, reflecting the fluid and integrated nature of e-commerce. Dirxion implemented polygon linking to change how consumers interacted with online catalogs and the ways in which Dirxion customers can deliver their product. Polygon linking allows Dirxion customers to have specific images outlined and linked so consumers can interact with the image in the same way they would with a standard product link. Once clicked, they deliver customers to the corresponding product information page on the company’s e-commerce website via Quick Views, iFrames, custom detail dialogues or simply a newly-opened browser tab. In doing so, Dirxion turns the focal drivers of catalog pages — product images — into places for customer interaction. The links can be customized to match brand identity as well. 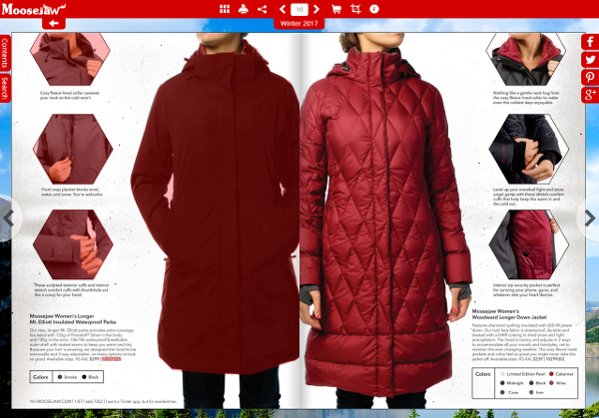 For some catalogs, polygon linked images will flash with color momentarily upon loading a page to let viewers know which images are linked. Customers can also choose not to have their polygon linked images flash at all. The option is more common for businesses with a modern, minimal design. Customers can also choose to have link association implemented into their catalogs. 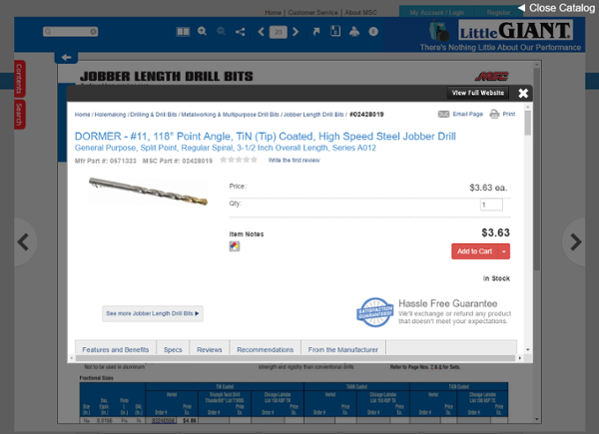 Link association highlights a corresponding product description on the page if a consumer hovers their cursor over a polygon linked image, which can also be customized or left out upon customer request. Dirxion has long been the leading industry innovator for online catalogs. Being the first digital publisher to switch to HTML5 optimization, Dirxion set the standard for the online catalogs experience. Other Dirxion features, such as Quick Views, the Bookshelf and, most recently, the Minimal UI, continues Dirxion’s tradition of industry revolution and delivering a personalized, on-brand online catalogs experience. The goals of websites have now gone beyond plain functionality in the current day and age of the Internet. The standard for websites is now based on a user-centered design, focusing on ease-of-use in order to build a website that’s both efficient and intuitive. Web users now expect a seamless, easy-to-use browsing experience that delivers on a consistent basis. The Daily Egg, the blog and online content website for Crazy Egg, outlines the biggest factors associated with website usability. One of these factors is the accessibility of a website. Strong hosting with attention to mobile responsiveness lowers the risk of web users running into error messages or failing to load on mobile devices due to slow connections. According to studies compiled by HubSpot, 64 percent of consumers expect web pages to load in four seconds or less on their smartphones. With desktops, 47 percent of consumers expect webpages to load in two seconds or less. The article also calls upon the importance of a clutter-free browsing experience with the least amount of distractions possible. These distractions could steer the consumer away from their initial goal. Design simplicity, familiarity, consistency, guidance, direct feedback and good information architecture resonate the strongest with customers and often serve as the foundation of their judgement of a website. According to bitcatcha, a web hosting research company, consumers directly associate fast websites with efficiency, trust and confidence. Website performance can also affect SEO. Google has recently prioritized speed and announced in 2010 they will take speed into consideration when deciding which websites rank highest on their search results. User experience, conversion rates, sales and SEO can all be positively or negatively influenced depending on the speed of your website. Dirxion online catalogs are built with both the user experience and performance in mind. Customers have a high degree of customization available, which can vary from a minimal UI (like with American Giant), or a busier and flushed out design (like with MooseJaw). Because Dirxion online catalogs are optimized with HTML5, their performance won’t falter on mobile devices and across multiple browsers. Dirxion’s online catalogs are all hosted at a data center in St. Louis. However, proxy servers located across the country ensure all catalogs perform equally no matter the location of the user. Pages load quickly, interactive links are responsive and Quick Views appear in seconds. The print catalog market has been slowly recovering following its decline during the recession. 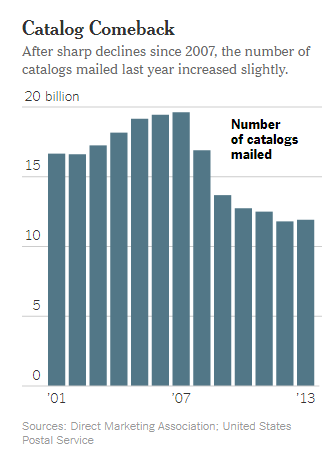 As reported in The New York Times, the number of catalogs mailed in 2013 increased to 11.9 billion, 60 percent of what it was in 2007. Many businesses are discovering increasing care in print catalogs has resulted in a boost in online sales. According to the Wall Street Journal, the company Bonobos discovered 20 percent of their new customers place orders after receiving a catalog. Customers who received the catalog also spent 1.5 times longer shopping as opposed to customers who didn’t. The science behind print catalogs better explains their effectiveness as a marketing tool. As reported by Elizabeth Holmes of The Wall Street Journal, print catalogs deliver a complete brand message. As opposed to catalogs in previous years, which were full of all the products a company offers, modern catalogs aim for more of an on-branded, visually inspirational experience. Patagonia catalogs, for instance, have opted to focus on long-form marketing materials and commissioned essays. Some of their catalogs are themed and have hardly any products featured. Targeting and versioning, the industry term for making different versions of a catalog for specific customer segments, have become easier thanks to massive amounts of data collected by e-commerce websites. According to the Harvard Business Review, companies can look at frequent visitor data and cross-reference industry databases containing information of millions of households. In doing so, they can send smaller sized catalogs to customers who are more active on the website as a method of multi-channel marketing, inspiring customer loyalty. The developments and advancements of the print catalog industry have translated to the online catalog market. Dirxion customer Restoration Hardware’s Chairman and CEO Gary Friedman is quoted in the Harvard Business Review saying, “We believe that what we are doing is moving beyond an intellectual connection to an emotional one. We are beginning to express those things we deeply believe in a way you can see it.” Product markets have become more alike and the Internet allows customers to access those products at a faster rate. It’s increasingly more important for a brand to differentiate itself in as many ways as it can. Dirxion online catalogs provide businesses with another avenue in their multi-channel marketing strategy that can meld the visually compelling aspects of a print catalog with the interactive and highly-mobile elements of online content.